We gather to sing in the old style of strong village voices flowing in a river of polyphonic sounds. We sing to bask in the beauty of old songs, with all their stories, their wisdom, and insight, but also to enjoy the melodies and particular harmonies of our Slavic homelands. We are not professional singers but often invite professionals or well practiced singers to teach us technique and style, or to share songs with us. For us, singing is a fully communal practice, including sharing songs, helping each other learn lyrics, sharing food and drinks, playing with harmonies around the table, and sometimes performing in a circle of friends. Anyone is welcome to join in on this practice! Ukrop: Ukrainian Folk Thursdays is a multi-activity series of workshops co-organized by members of the Lemon Bucket Orkestra and Kosa Kolektiv that takes place every Thursday evening at St. Vladimir Institute in Toronto (620 Spadina Avenue). Workshops will alternate between singing, dancing and crafts, and are all pay-what-you-can, with a suggested donation of $10 - $20 per workshop. Check out our calendar for more details. We generally meet every Thursday around the table, after 7pm with breaks during holiday times. Open to all regardless of age, ability, language. Instruction in Ukrainian, with translation. Song lyrics in Ukrainian with English transliteration. Vesnianky- Songs of Spring series - March 27, April 3, April 6*, April 10, 2014 Thurdays: Kosa studio, 4 Bellwoods Ave., Toronto *Sun April 6: St. Vladimir Institute, 620 Spadina Ave., TorontoIn preparation for spring, we are meeting to learn Ukrainian ritual songs which were part of the spring rites in ancient times: "vesnianky".We will be singing and taking part in the St. Nicholas church community "hailky" or "spring revels" on Easter Sunday, April 20th, in Trinity Bellwoods Park. 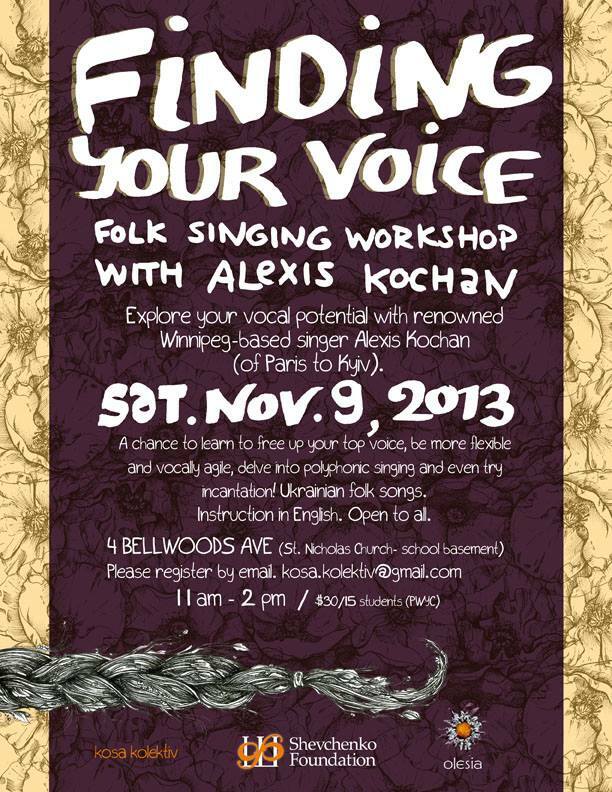 Nov 10, 2013 4 Bellwoods Ave. Alexis Kochan will teach a singing workshop with a variety of Ukrainian folk songs. Oct 20, 2013 - St. Vladimir Institute - This is an opportunity to learn about the traditional village style of singing and to hear a variety of folk songs that demonstrate the "white voice" or "village voice". Participants will learn some history and context to better understand the polyphonic singing, and will get a chance to learn the vocal techniques and breathing exercises involved. You will learn to sing Ukrainian folk songs as part of a strong and positive group.For beginners and those wishing to have more experience and practice singing folk music. All are welcome!! NO age restrictions, no language restrictions.Instruction by Anastasia Baczynska. Song lyrics provided in both English and Cyrillic. Instruction in English. PWYC (suggested $20/$10 students)Generously supported by Shevchenko Foundation and St. Vladimir Institute. Part of the Traditional Ukrainian Songs Workshop Series, led by Bozena. Look out for the next big workshop on Sun. Nov. 10th with renowned Canadian singer Alexis Kochan. Save the date! March 21, 28, April 4, 11, 18, 25, 2013 In preparation for spring, we are meeting to learn Ukrainian ritual songs which were part of the spring rites in ancient times. We will be learning songs that call forth spring, as well as "hailky", songs that are sung while dancing and playing traditional games at Easter time. We will be performing and taking part in the St. Nicholas church community "hailky" on Easter Sunday (May 5th), in Trinity Bellwoods Park. Sat. March 16, 2013. 1-4:30pm Teachers: Maria Sonevytska & Eva Salina Primack, of the NYC based trio Zozul'ka. Come join us to learn traditional songs from the Balkans and Ukraine.Coaching with pronunciation and vocal techniques. No experience necessary! Thursday February 28th, 2013 7-9pm. Kosa and friends will be taking part in an intimate singing session at Whippersnapper Gallery- to sing- to momentarily steep an intimate crowd in unified voices, to share stories and history through harmonized melodies, to fill a space with the ephemerality of live sounds. Every Thursday, 7-9pm. starting November 29th, until Dec. 20th 608 Ossington Ave. It's that time of year again! We're gearing up for the Koliada season and learning new carols, plus practicing old ones. Come join us to go caroling in January! We're planning on singing on January 7th and 8th at house parties, and outside of St. Nicholas Church the day after Malanka (traditional new year's), on Sunday, January 13th. If you don't know us, or don't know what to expect, but would like to be a part of this, come to one of the rehearsals and check it out! It's very informal and friendly. If you wish to be added to our "singing group" mailing list, please email Bozena at bhrycyna@gmail.com, or if you have a facebook account, join the Kosa Kolektiv group, to be informed of last minute changes, view videos of songs, and share files. These workshops will be a chance to learn a variety of different folk songs from different teachers, presenting Ukrainian, Serbian, Polish, Macedonian, (and possibly other) ethnic traditional songs. Yura Rafaliuk of Ludy Dobri will lead one session (on Oct 4th). Bozena of Kosa will lead others. In preparation for the summer solstice celebration of Ivana Kupala, celebrated by Ukrainians and Slavic people everywhere, we will be learning Ukrainian Kupalo songs from various regions. Anastasia Baczynska will help lead vocal warm-ups and teach songs with Bozena and Marichka. To learn more about the holiday of Kupalo, you can check wikipedia. To experience Kupalo, come celebrate with us! Kosa Kolektiv will be celebrating the ancient pagan holiday on June 22nd! Contact us for more information. Will be learning "Oy tam na hori", with a chance to perform the song in a theatre piece at Clay and Paper Theatre's "Day of Delight" held at Dufferin Grove Park in June. Anastasia Baczynska of the Lemon Bucket Orkestra will be teaching vocal techniques specifically relevant to those interested in singing in authentic "white voice" (biliyj holos) or village-style. She will also be teaching a couple of vesnianky or spring songs that were traditionally sung in villages in Ukraine to usher in spring and the life-giving season. 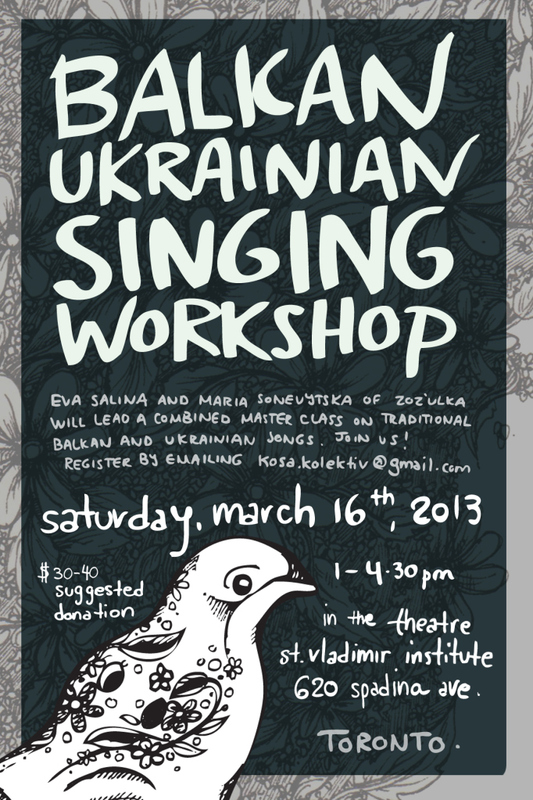 To inquire/register email kosa.kolektiv@gmail.com with slavic singing in the subject.